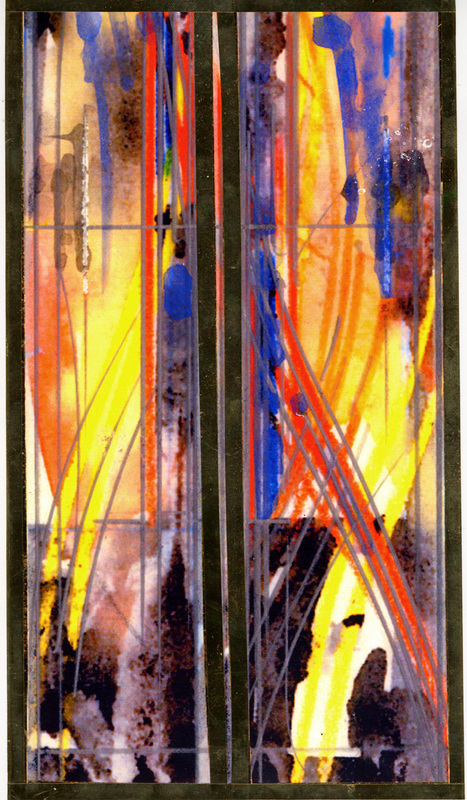 The art of the two stained glass Ark Doors adds warmth to the simple space. The doors are made of red and gold colors, and the flowing shapes of glass and painting suggest the flames of the Burning Bush. The Star of David is suggested at the top. The flowing shapes of glass and paint unite the two doors, creating a rich dramatic focus for the torahs and add drama to the ritual opening of the doors. Jewish symbolism continues with a sandblasted menorah and several small painted panels: The Fruit Of The Vine at Rosh Hashanah, and at Passover. Salo Levinas, Architect.